A post-graduate in Hospital Administration from the renowned Tata Institute of Social Sciences (TISS), Mumbai, he holds a degree in Medical Sciences from PGI Chandigarh. He is one among the four Indian individual members of the International Society for Quality in Healthcare (ISQua) based out of Dublin. He is also an approved Surveyor for ISQua’s International Accreditation Programme. 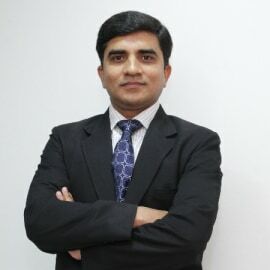 He was previously the Group Chief Operating Officer of the Sunshine Global Group of Hospitals based out of South Gujarat. He have held senior positions in various Indian Hospitals for a number of years. In addition to the various honours he has won for his organizations plus he has various awards and prestigious positions to his credit. He was Winner of the Prestigious "Aikat Memorial Gold Memorial Gold Medal" for the Best Outgoing Student of P.G.I.Chandigarh (1996). He is Guest faculty with many Indian Universities and Business schools for teaching programs in Hospital Administration & healthcare quality.